HORUS served many functions in the Egyptian pantheon, most notably being the god of the sky. 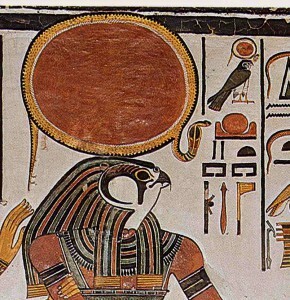 Since Horus was also said to be the sky, he was considered to also contain the sun and moon. It became said that the sun was his right eye and the moon his left, and that they traversed the sky when he, a falcon, flew across it. Later, the reason that the moon was not as bright as the sun was explained by a tale, known as the contestings of Horus and Set, originating as a metaphor for the conquest of Upper Egypt by Lower Egypt in about 3000 BC. In this tale, it was said that Set, the patron of Upper Egypt, and Horus, the patron of Lower Egypt, had battled for Egypt brutally, with neither side victorious, until eventually the gods sided with Horus. 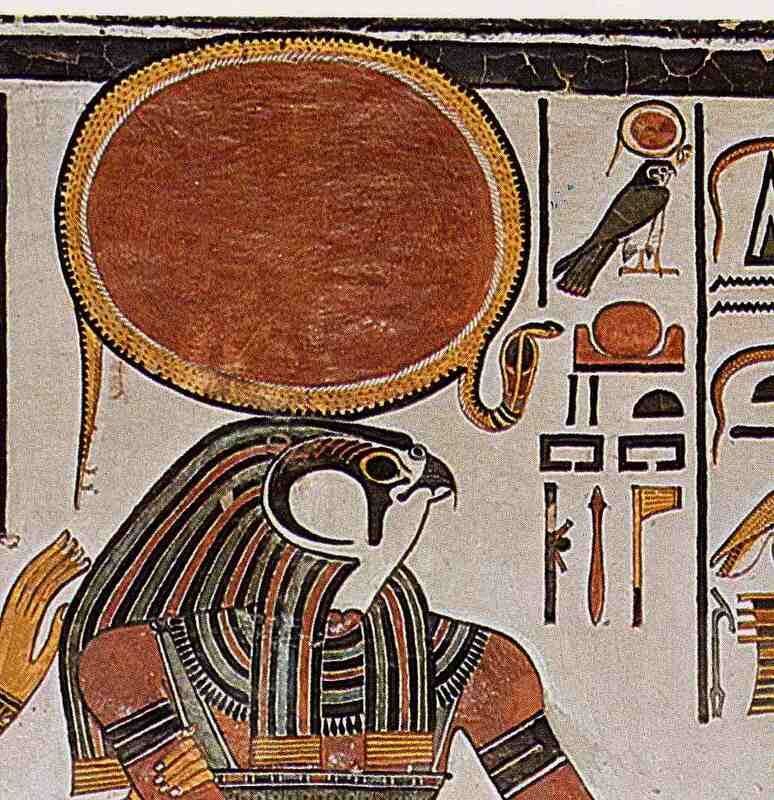 As Horus was the ultimate victor he became known as ‘Horus the Great’, or ‘Horus the Elder.’ In the struggle Set had lost a testicle, explaining why the desert, which Set represented, is infertile. 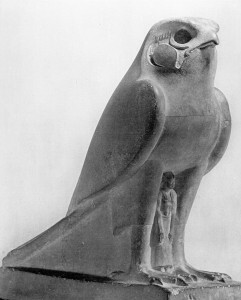 Horus’ left eye had also been gouged out, then a new eye was created by part of Khonsu (the moon god) and was replaced. In later Egyptian dynastic times, Ra (the sun god) was merged with the god Horus, as Re-Horakhty (“Ra, who is Horus of the Two Horizons”). He was believed to rule in all parts of the created world the sky, the earth, and the underworld. He was associated with the falcon or hawk. The Eye of Horus is an ancient Egyptian symbol of protection and royal power from deities, in this case from Horus or Ra. In the Egyptian language, the word for this symbol was “Wedjat“. It was the eye of one of the earliest of Egyptian deities, Wadjet, who later became associated with Bast, Mut, and Hathor as well. Wedjat was a solar deity and this symbol began as her eye, an all seeing eye. In early artwork, Hathor is also depicted with this eye. Funerary amulets were often made in the shape of the Eye of Horus. 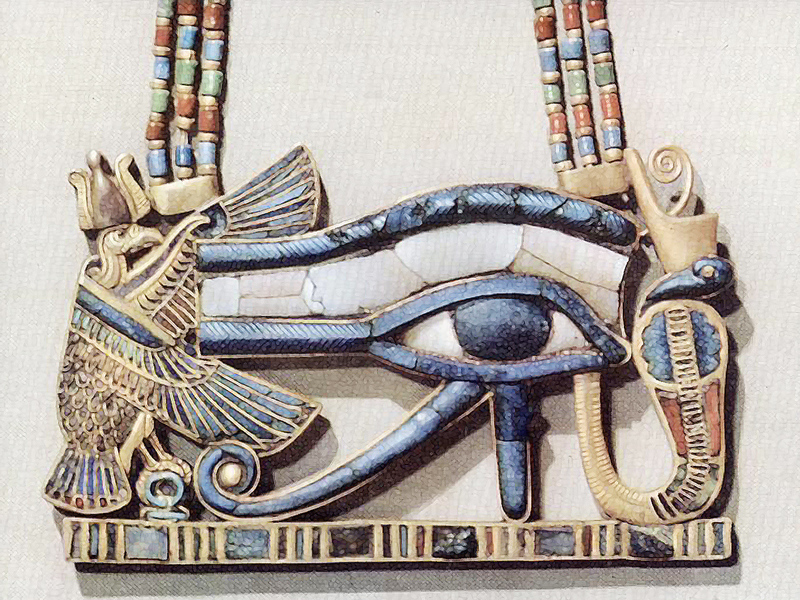 The Wedjat or Eye of Horus is “the central element” of seven “gold, faience, carnelian and lapis lazuli” bracelets found on the mummy of Shoshenq II. The Wedjat “was intended to protect the king [here] in the afterlife” and to ward off evil. Ancient Egyptian and Near Eastern sailors would frequently paint the symbol on the bow of their vessel to ensure safe sea travel.